Sleeps 4, 2 bedroom villa. Villa Sedir is a villa which has a very beautiful soul and it has been built in 2014. It has private pool and sea view. Suitable for families, couples, etc. 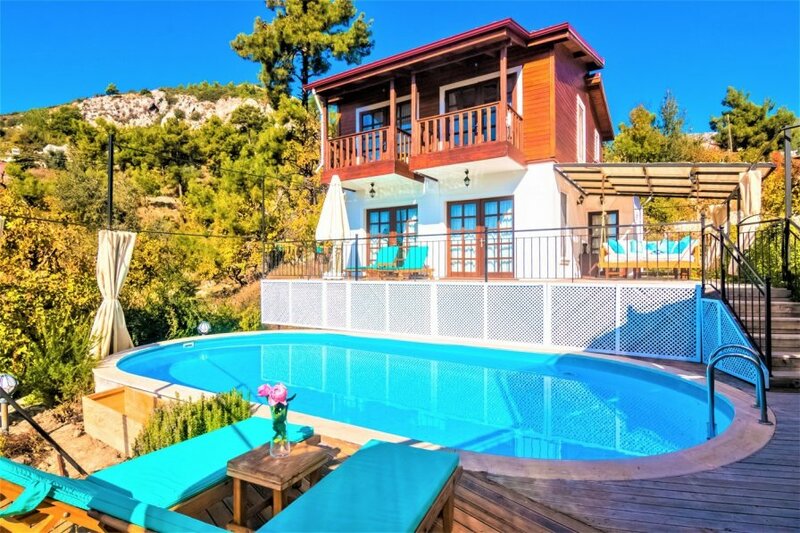 Villa Sedir is a villa which has a very beautiful soul and it has been built in 2014. And this stunning villa is located in the great valley of Islamlar Village and has great views of nature. Villa Sedir has private pool (size 8,20x4,20) and a large wooden terrace with shadow area. You can also enjoy at back terrace with BBQ and dining area. Its great natural atmosphere will complete your holiday with birds' songs, pine trees and fresh air. All bedrooms also large terrace have stunning views of sea, mountain and nature. Village's centre and cosy restaurants are very close to villa - 5 minutes by walking. Also 15 minute drive to the sophisticated and lively Kalkan. Unspoiled Kaputas Beach, Patara, Xanthos, etc. are some of the close places to see when you stay here. You can also see some archaeological areas by walking Lycian Ways. Satellite TV, internet access, and full air-condition will improve your comfort. Villa Sedir has 2 bedrooms ( 1 Double Beds, 2 Single Beds ) and 2 bathrooms. And also it is furnished tastefully by handmade special units and accessories. Sleeps 4, 2 bedroom villa. Villa Sedir is a new villa which has a very beautiful soul and it has been built in 2014. It has private pool and sea view. Suitable for families, couples, etc.